On July 6, 2018, the team of researchers working on geotechnical and archaeological applications of geoparticles, arrived at the site of Apollonia, in northern Greece, near Thessaloniki. The Labex UnivEarthS actively participates in this project through the project I2: Geoparticles. The project received funding from the Interdisciplinary Mission under the reference ARCHé (Archeology with Cosmic Rays, to probe Hellenic tumuli). This interdisciplinary project aims to study the feasibility of this technique for the exploration of small archaeological structures and to carry out an initial set of measurements as proof of concept. The onsite team consists of scientists and experts, including Jacques Marteau and Jean-Christophe Ianigro of IPN Lyon (UMR5822, University of Lyon, CNRS-IN2P3), Grigorios Tsokas of the University of Thessaloniki, Theodoros Avgitas and Eleni Chatzichristou of the Labex UnivEarths and Stratos Koufos (videographer-videographer). Left: The trailer with the detector just arrived on site. Right: the weather quickly deteriorated and intense thunderstorms broke out. For this feasibility experiment, a mobile detector was designed, built and brought to the field by the IPN team of Lyon. The journey of the detector from Lyon has thus consisted of a crossing of Italy by motorway, then of the Adriatic sea by boat, then through the north of Greece, until it reached the site of Apollonia, in the immediate vicinity of the tumulus. This long journey and the vibrations suffered did not impact the detector, which arrived on site in perfect shape. The choice of this tumulus was motivated by the fact that it has already been the subject of geophysical studies in the past, notably by researchers from the University of Thessaloniki, using techniques such as electrical resistivity tomography, which allowed to reveal two internal structures. For this reason, this tumulus represents an ideal setting for the first experimental measurements testing the capabilities of muon tomography. J. Marteau (IPNL) and T. Avgitas (UnivEarthS) during installation. To successfully complete the installation, several obstacles had to be overcome: the immense sunflower fields surrounding the tumulus were not the ideal setting to maneuver the van and trailer; negotiations with local farmers fortunately allowed the detector to be installed in a suitable place without damaging the fields. 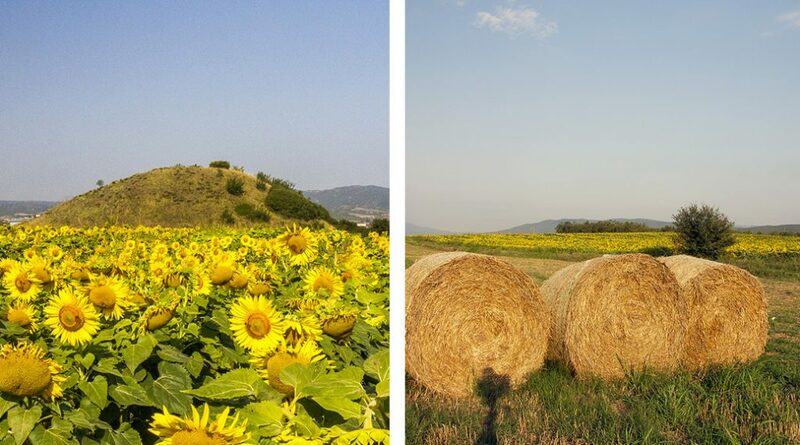 The tumulus in the middle of the sunflower fields on the site of Appolonia. 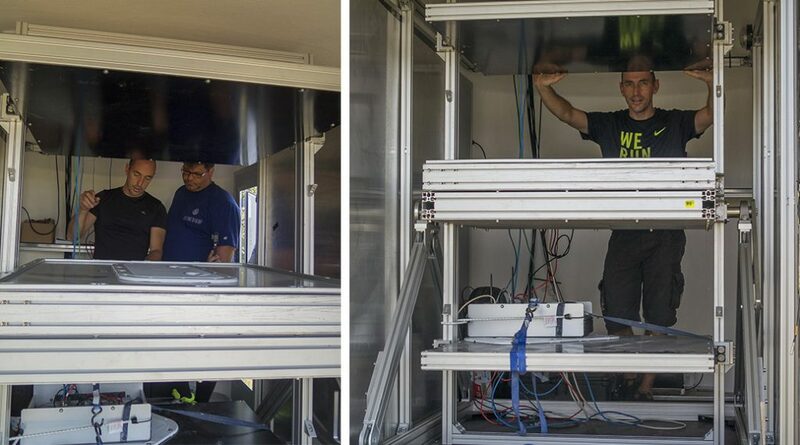 The lack of electricity or network connection were solved by the development by the IPN team of a fully autonomous detector operating on solar panels and batteries. The data are thus permanently acquired and sent continuously to the IPNL in Lyon. Low floxis recorded during the calibration phase (left) and the tomography run after 14h (right). These are quality checks loads, uncorrected, but they show the shadow of the tumulus. The installation was extremely successful. Already on the first afternoon, calibration of the instruments could be initiated with the first data flowing in. Nevertheless, vigilance is needed 24/24: intense thunderstorms required nighttime intervention to verify that the equipment survived bad weather. In addition, micro-seismic events need to be monitored in a systematic way to eliminate any impact on the instrument’s calibration, knowing that the Appolonia zone is subject to weak but regular seismic activity. Theodoros Avgitas will therefore remain on site for the duration of the mission, scheduled for 3 months, in order to verify the smooth running of the experiment and the transmission of data. The acquisition will be continuous throughout this period,and will allow him to work on data reduction and to perform simulations. The first analyses, conducted remotely by the team of the IPN of Lyon and its collaborators, Marina Rosas-Carbajal of the IPGP and Antoine Chevalier, post-doc of the Labex LIO in Lyon, enabled to verify proper functioning of the detector and to quickly quantify the attenuation of muon flow as it passes through the tumulus. In addition to the scientific mission itself, the opportunity was taken to conduct interviews with team members, images and videos of the expedition and the facilities. This audiovisual material will be presented progressively on this site, in order to explore in more detail this fascinating mission at the interface between geosciences, astrophysics and archaeology! Communication was an important aspect of the expedition, to transmit the fascination of the experiment and related research (E. Chatzichristou, Stratos Koufos).